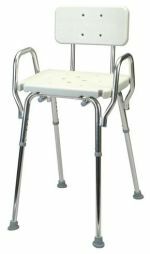 Shower stools for seniors are a safety feature that can help those who get tired standing. As a general rule, people of all ages are more comfortable in their home than anywhere else. This is especially true of seniors. The aging process often takes a toll on one’s body and certain adaptations may be necessary in order to make the home a safe and comfortable environment. Safety in the bathroom is a major concern. One of the most important steps toward creating a safe environment in the bathroom is the addition of shower stools. The simple addition of a shower stool will enable a person to maintain a level of independence for a longer period of time. By having bath stools for seniors, a safety shower mat, and some shower grab bars, the bathroom becomes much more accessible and safe. When purchasing a shower stool, you need to be certain it meets ADA guidelines. These guidelines are designed to insure that the stool is durable. The stool must be installed properly in order to provide the maximum amount of safety. Instructions should be included with the seats that indicate proper installation in accordance to ADA specifications. It is definitely important to check the maximum weight capacity the stool is designed for. 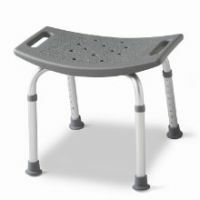 Gray Shower Stool with Backrest – This shower stool has great reviews and supports a lot of weight. It is durable and quite affordable. 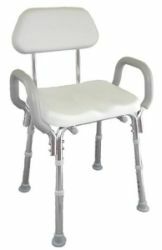 High Shower Chairs – These hip chairs are much higher than normal shower chairs to make it easier to sit and stand up from a seated position. Great for someone with partial or total hip replacement, arthritis, or knee surgery. The seat height is adjustable from 25 to 28.75 inches. Weight capacity of 250lbs. Padded Shower Chairs – Padded back and padded armrests provide comfort when sitting. Extra suction tips on the legs of this chair help with a wet shower area. You want to purchase a shower stool that is mildew and corrosion resistant. Most stools are white and have stainless steel frame and legs. With some styles you have the option of choosing a cushioned seat which can vary in color. Design styles vary. You may prefer a very simple fold up stool that attaches to the wall and can be lifted up when not in use. Or, you may find that an L-shaped wall mounted shower stool addition is best for your needs. The L-shape seat can be installed in a left hand or right hand design. Shower stools can actually be an attractive addition to a shower. Anyone of any age could find them a very convenient addition to the shower. Teak wood or Brazilian walnut seats give a shower a spa-like appearance while providing safe seating in the shower. Shower stools are not only a safety feature but they are a convenient accessory for anyone.